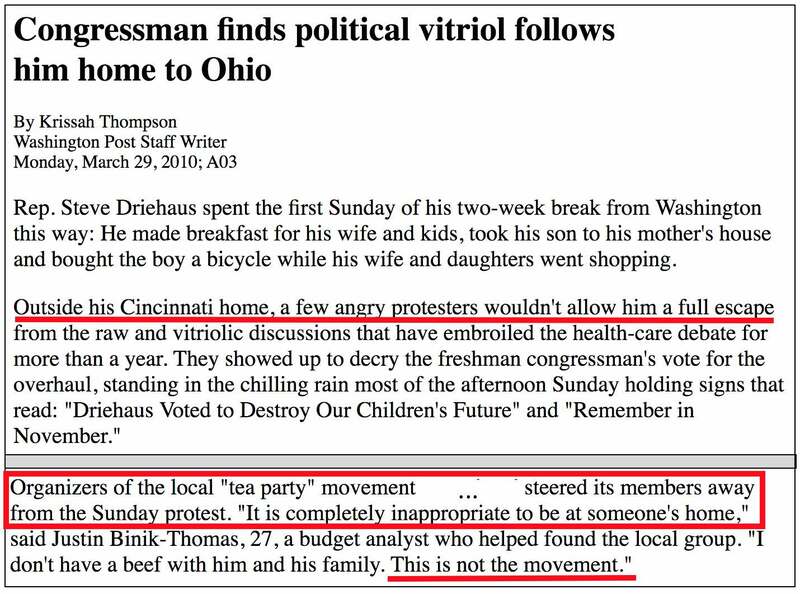 In 2010, some Obamacare opponents conducted scattered protests at politicians' homes. They backed away from the tactic when Tea Party groups and others declared that home protests should be out of bounds. Don't expect leftist protesters to receive any similar admonishments — especially if they continue to receive borderline-sympathetic coverage like protesting gun-control promoters, and even a person arrested for vandalism, received at the Washington Post on Friday. ... someone made a fake website for his wife’s interior design business, altering images of artwork to show photos of child gun violence victims. ....Meanwhile, the NRA has become more forceful, opposing any new gun regulations and blasting dissenters with vitriol. These more radical activists say Cox, the executive director of the NRA’s Institute for Legislative Action since 2002, deserve to be singled out for that intransigence. Weiner didn't cite any gun-control movement leaders who have distanced themselves from home and business protest tactics. That's likely because there aren't any. Amanda Gailey is the leader of a group called Nebraskans Against Gun Violence. In 2016, she was invited by the Obama White House to personally meet President Obama when he gave a speech in Omaha. Weiner paraphrased a UCLA law professor who claimed that the gun-control movement "has been one of conciliation and increasingly modest demands over the past 50 years," while "the NRA has gotten more forceful, opposing any new gun regulations and blasting dissenters with vitriol."